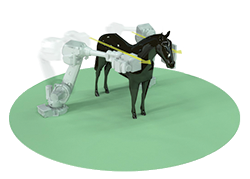 The Equimagine System is a high definition, multi modality imaging platform capable of imaging an entire horse in a single series. can replace six imaging devices. This paradigm shift in technology brings state of the art, ultra high-speed, high-definition, four dimensional video-radiography leading to improved patient outcomes. The Equimagine™ scanners allow for direct assessment of joint arthro-kinematics, skeletal kinematics with one order of magnitude higher accuracy than current indirect measurement techniques. In addition the assessment of trauma at the level of micro-crack propagation, and the use of Tomosynthesis for prevention of catastrophic events. The advanced operating system allows the end user to map cartilage deformation associated with the onset of a subchondrial damage-PROGNOSIS. 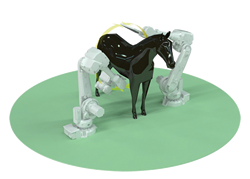 Further capabilities allow the operator to view tendon mechanics, assess lameness, and look at head, neck, back problems. Technology for small veterinary care providers with limited access to imaging equipment and facilities. Patient can be scanned in a natural state (i.e. standing) and in motion. No need for the patient to be fully anesthetized. The option to switch between sensors during a single imaging session without patient repositioning; Gamma camera, Densitometry options, linear panels, Tomosynthesis panels, Intensifiers. Patient specific saddle and shoe fitting. 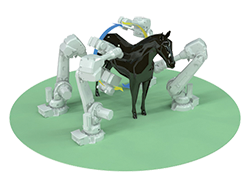 By employing open-architecture high-precision robotic technology we are now able to perform axisymmetric and non-axisymmetric scan pathways never done before in veterinary imaging. capable of 3D volumetric imaging (unconstrained scanning geometry), Digital Radiography, Densitometry, Tomosynthesis and Panoramic Imaging. True four dimensional (4D), Ultra-precise, Ultra-safe, dynamic imaging for enhanced productivity and significantly increased diagnostic capabilities. Whole body scanning performed in just minutes for the first time during load bearing. Real Time High speed 4D soft tissue deformation tracking. Open bore geometry allows unprecedented geometrical configurations defining specific regions of interest per image acquisition. Real time 4D Data Fusion. 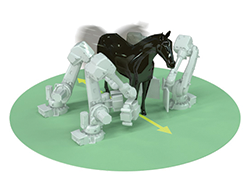 The panoramic scanner provides a whole-body biplanar image, primarily to assess angulation and the relationship of the various anatomical axis and mechanical axis as well as the geometric relationship of the loaded structures. Dynamic Roentgen Stereo video-radiography analysis is performed within the region of interest under load and motion. This provides the most accurate, analysis for diagnosis, planning, kinematics and patient follow up. The next generation Tomosynthesis scanner for high-contrast, high-definition (1000 or more slices) region of interest body areas or segments where very detailed morphological information is of prime significance. Tomosynthesis provides accurate 3D static morphologic data, with ultra-thin slices –out of plane resolution- to reduce the potential of interpretation error. Measurement of region specific bone density as it associates with evaluation for implant fixation. Detection of increased blood flow associated with probable bone fracture or inflammation and hard tissue abnormalities related to ligament injury, arthritis or laminitis. Next generation Tomosynthesis technology for low–irradiation full 3D morphological imaging. The CT imager obtains specific 3D geometry data. A specific region of the anatomy can be isolated to further reduce exposure to radiation. The target stands at full load bearing position at predefined location. 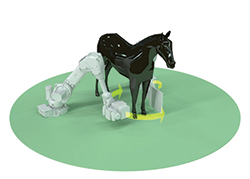 The Equimagine™’s scanners rotate around the target capturing consistent high-resolution x-ray images at axisymmetric or non-axisymmetric pathways to enable more precise positioning and reduces magnification factors and alignment inconsistencies.